Stand Steady CEO Day Martin has been selected as a featured seller on Amazon Business, Amazon’s new business to business marketplace, in their promotion to highlight women-owned businesses and their products on International Women’s Day. Amazon has selected a CEO of a standing desk manufacturer, Day Martin, as a bright, effective example of a woman business owner, whom girls and women all over the world can look to for inspiration, on International Women's Day. Day Martin, CEO and founder of Stand Steady, has been selected by Amazon, the largest Internet-based retailer in the United States, to celebrate International Women’s Day. She will be a featured seller for Amazon Business’s promotion to highlight women-owned businesses and their products. International Women’s Day is a day to celebrate the achievements of women, while bringing awareness to the fact that women's voices are greatly under-represented, especially in leadership roles in American companies, and business regions like the Silicon Valley. “The World Economic Forum… (predicts) that, at the current pace, the world will not close the global gender gap for another 117 years,” as stated on theguardian.com. Amazon has selected Day Martin as a bright, effective example of a woman business owner, whom girls and women all over the world can look to for inspiration. Prior to founding Stand Steady, Day Martin always had an entrepreneurial spirit. After obtaining her undergraduate degree at Cornell, Day spent the first part of her career developing direct marketing skills at catalog companies. After that, she did data analytics for the Corporate Executive Board. After a car accident in 2012, she sought relief from constant back pain by standing at work. When she was unable to find an affordable standing desk converter to put in her cube, she was inspired to build her own, which she named the Original Stand Steady. After colleagues started asking where they could find one, she decided to take the leap and started her own business. 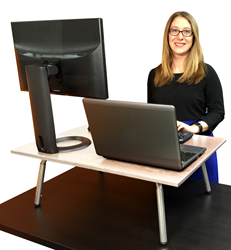 Stand Steady is located in the greater Washington, DC area and is a leading manufacturer of affordable, ergonomic, adjustable standing desks and office accessories. Stand Steady has sold thousands of desks nationally and internationally. Standing at work provides a solution to the negative impacts of sitting disease, such as back pain and increased rates of cardiovascular disease and diabetes. Stand Steady is a Certified WOSB (Woman Owned Small Business); for more information about Stand Steady, please visit the company’s Web site at http://standsteady.com/.